Hey Everyone! How are you all doing? I cant believe we are almost a week into Ramadan. 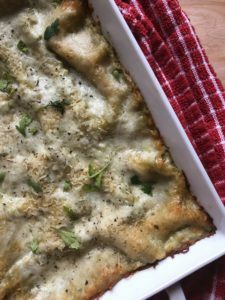 I’m sharing a delicious comfort food dish with you all that is easy to whip together and everyone in the family especially the kids will enjoy it. Lasagna is one of those homey dishes that make everything feel just right. 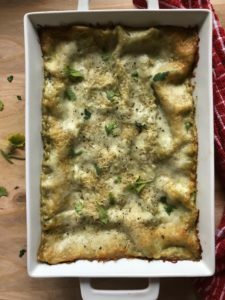 I’ve always been a fan of white lasagna and even more with garlic, mushrooms and spinach. I made this for a family gathering the other night for dinner and it was a hit! I even showed you all how to make it on my highlights on my Instagram @fufuinthekitchen. I hope you enjoy this super easy and delicious dinner dish ! Saute garlic and onion with some olive oil in a pan. Add some salt and pepper. Once the onion looks translucent which takes at least 5-7 minutes, begin to add the sliced mushrooms and the spinach. I recommend adding the spinach a little at a time. It does wilt quickly. Add some salt, pepper, and garlic powder to that. Set aside this mixture once everything is cooked. Taste to see if it needs any more seasoning. In a saucepan, pour half of the pesto jar and all of the alfredo sauce and warm it up. Add a little salt, pepper, and garlic powder. In a small bowl, add the ricotta then the Italian seasoning to it along with some salt, pepper, and garlic powder. Mix all together well. 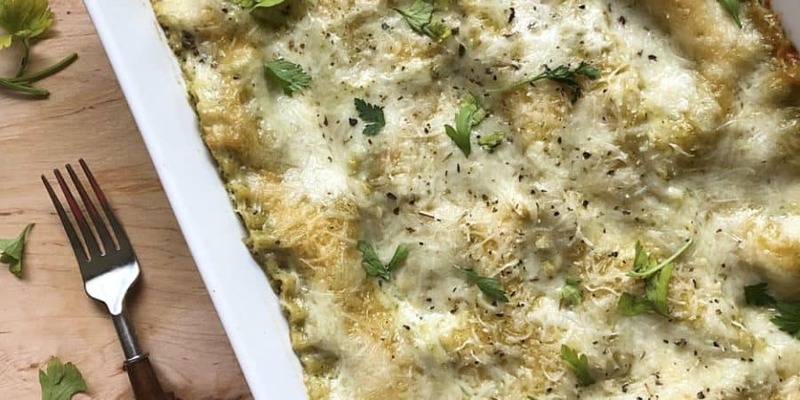 Brush a casserole or lasagna baking pan with olive oil. Add a small layer of sauce on the bottom of the pan then add the lasagna on top. Probably 3-4 lasagna pieces. Then add half the ricotta mixture and spread that evenly. Then add half of the spinach and mushroom mixture and spread throughout. Then add about half of the sauce on top of that then top it with some shredded Italian cheese. Do the same thing over again. Add the lasagna pieces then the ricotta then the mushroom and spinach topped off with the sauce then cheese. Add another layer of lasagna, top with leftover sauce and cover with cheese. Sprinkle the top with Italian Seasoning, garlic powder, salt and pepper and parmesan. Bake in the preheated oven for 40 minutes. If you like to more browning on top then you can broil for 2 minutes as well.